SriLankan Airlines gave its customer Peter Phillips of Shropshire (UK) a surprise by rewarding him for his loyalty to SriLankan Airlines. 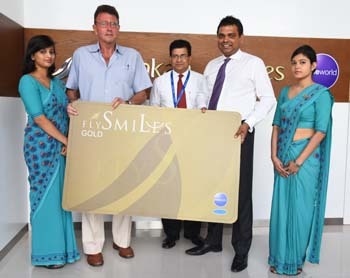 Accordingly, SriLankan’s frequent flyer programme, FlySmiLes, presented him with a Gold card to help him keep visiting his favourite destination of Sri Lanka during his retirement. Phillips had been vacationing in Sri Lanka up to three times a year since discovering the island’s tourist attractions during a chance visit in 1985. His father was based in Sri Lanka during World War II as a member of the Royal Air Force, helping protect the Royal Navy’s main Indian Ocean base in Trincomalee, now a popular resort destination.